Tampa, Fla. – (October 12, 2018) - IT Authorities (ITA) and Rutherford and Associates have announced the formation of a strategic partnership to deliver an easy-to-consume, cloud-based ERP solution designed to streamline processes for fast-growing beverage companies. 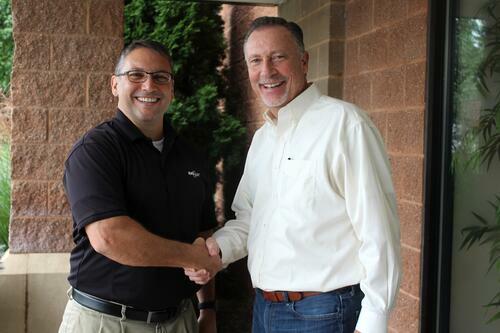 Paul Rutherford, President of Rutherford and Associates (left) with Pete Bober, CCO of IT Authorities (right). Rutherford and Associates is behind eoStar, a comprehensive ERP route accounting software solution that powers modern food and beverage wholesale and distribution organizations across North America. Developed by industry experts, the software combines state of the art forecasting technology and advanced inventory management tools for a fully integrated route management solution for direct store delivery (DSD). For more than 30 years the company has provided the finest in route accounting solutions utilized by some of the most successful modern beverage distribution organizations across the US, including Monarch Beverage Company, Alliance Beverage Distributing, Andrews Distributing, Coastal Beverage Company, and Manhattan Beer Distributors. Rutherford is a Microsoft Gold Certified Partner and is based in Holland, Michigan. Visit eoStar.com for more information. IT Authorities is the premier Total Beverage Solution Provider offering turnkey operating environments with monthly subscription pricing that covers everything from installation to support. Our expertise and passion in the beverage industry uniquely positions us to be your partner for all things IT and business operations technology. Visit www.itauthorities.com or call at 866-587-5211 to learn more.